K. Scott, S. W. Beckham, M. Gross, G. Pariyo, K. D. Rao, G. Cometto & H. B. Perry, What do we Know about Community-based Health Worker Programs? 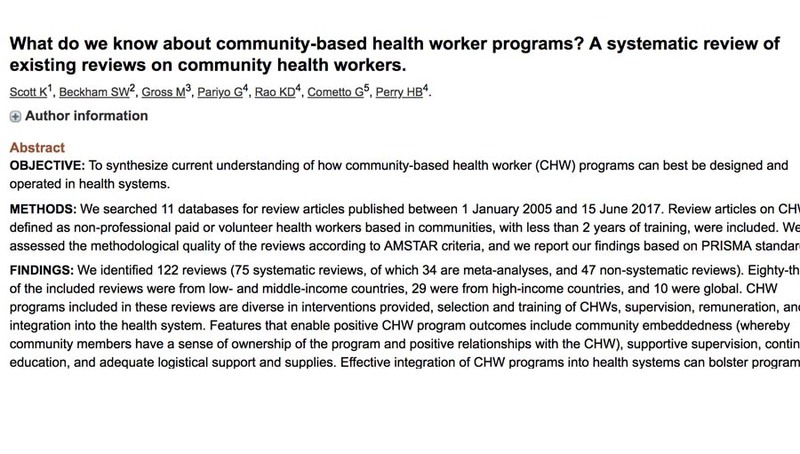 A Systematic Review of Existing Reviews on Community Health Workers, Human Resources for Health, 2018, 16. We identified 122 reviews (75 systematic reviews, of which 34 are meta-analyses, and 47 non-systematic reviews). 83 of the included reviews were from low- and middle-income countries. CHW programs included in these reviews are diverse in interventions provided, selection and training of CHWs, supervision, remuneration and integration into the health system. Features that enable positive CHW program outcomes include community embeddedness (whereby community members have a sense of ownership of the program and positive relationships with the CHW), supportive supervision, continuous education, and adequate logistical support and supplies. Effective integration of CHW programs into health systems can bolster program sustainability and credibility, clarify CHW roles, and foster collaboration between CHWs and higher-level health system actors. We found gaps in the review evidence, including on the rights and needs of CHWs, on effective approaches to training and supervision, on CHWs as community change agents, and on the influence of health system decentralization, social accountability, and governance. Evidence concerning CHW program effectiveness can help policymakers identify a range of options to consider. However, this evidence needs to be contextualized and adapted to inform policy and practice. Advancing the evidence base with context-specific elements will be vital to helping these programs achieve their full potential. A new update of the Cochrane EPOC review on nurses as substitutes for doctors in primary care. A team of Cochrane authors based in the Netherlands, Thailand, and the United Kingdom worked with Cochrane Effective Practice and Organisation of Care to update the 2005 Cochrane Review that investigated the impact of nurses working as substitutes for primary care doctors on: patient outcomes; processes of care; and utilisation, including volume and cost. Nine randomized trials were added to this update, bringing the total examined to 18. One study was conducted in a middle-income country, and all other studies in high-income countries. White, C., Changing Trends in Mortality and Health in England and Wales: 1990-2017 (Experimental Statistics), Office for National Statistics, 2018. Harris C, Green S,. et. al, Sustainability in Health Care by Allocating Resources Effectively (SHARE) 1: Introducing a Series of Papers Reporting an Investigation of Disinvestment in a Local Healthcare Setting. BMC Health Serv Res. 2017 May 4;17(1):323. K. Scott, S. W. Beckham, M. Gross, G. Pariyo, K. D. Rao, G. Cometto & H. B. Perry, What do we Know about Community-based Health Worker Programs? A Systematic Review of Existing Reviews on Community Health Workers,Human Resources for Health, 2018, 16.
van de Klundert, J., van Dongen J., et al., ‘We are Planning to Leave, All of Us’: A Realist Study of Mechanisms Explaining Healthcare Employee Turnover in Rural Ethiopia, Research Article, Human Resources for Health, 13 August, 2018.